We are now in the season of Lent, which begins on Ash Wednesday and concludes before the Mass of the Lord’s Supper on Thursday of Holy Week. Lent is an opportunity given to us so that we might become more like Christ, the one who came into the world to save us from our sins and offer us eternal life. When we receive an opportunity, we must make sure we take full advantage, avoiding the temptation of either letting it pass by or giving a halfhearted approach to our Lenten observance. As the Catechism of the Catholic Church informs us, “by the solemn forty days of Lent the Church unites herself each year to the mystery of Jesus in the desert.” (CCC 540). There is no better companion on our Lenten journey than our Savior. Therefore, let us courageously make the conscious decision to unite ourselves to Jesus as he leads us into the desert. 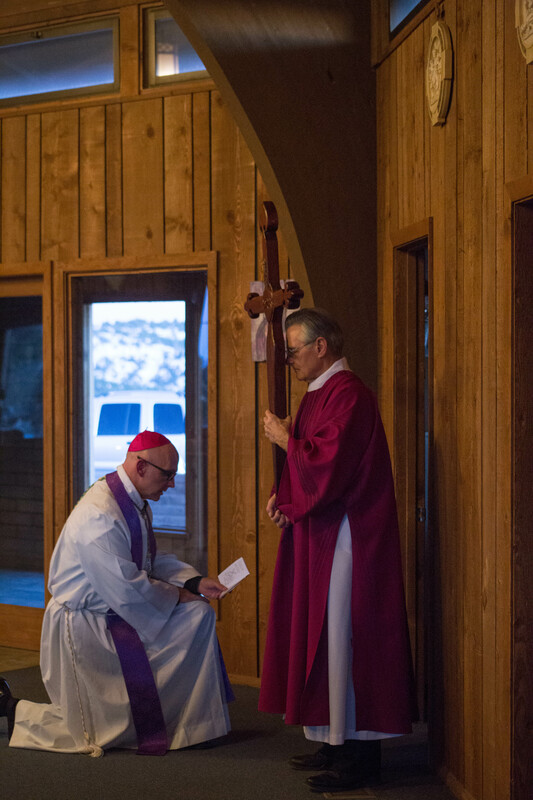 Bishop Wall leads the Stations of the Cross, Wednesday March 1, 2017. The Catechism defines prayer as “The elevation of mind and heart to God in praise of His glory; a petition made to God for some desired good, or in thanksgiving for a good received, or in intercession for others before God. Through prayer the Christian experiences a communion with God through Christ in the Church”. The movement of the heart and mind toward our loving God is an act that expresses our gratitude to God for His generosity to us. Our act of prayer is also an expression of trust, as we take the disposition of a child, who relies upon his or her Heavenly Father, who will only give us what we need. 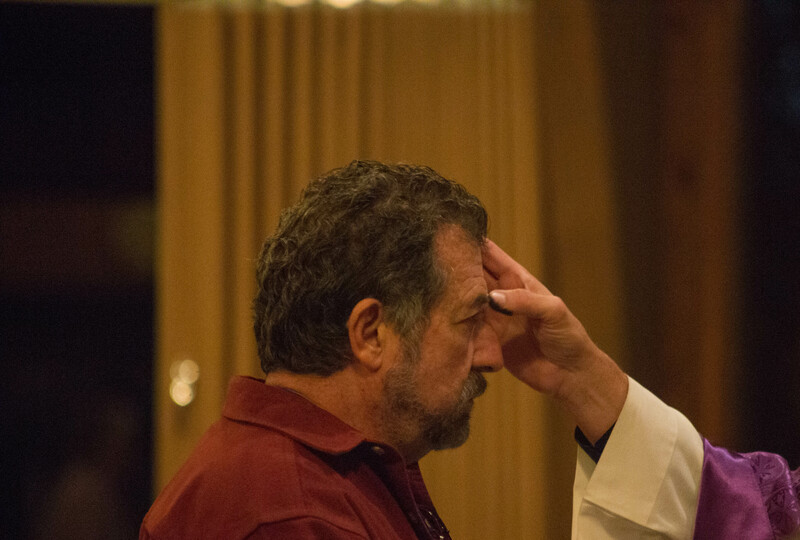 If you’ve been away from Mass, simply return. If it has been a while since you’ve picked up your bible, give ten minutes to the Lord by opening your heart to the scripture, in particular the Gospels. If your rosary is unused, pick it up, meditate on the life of Christ through the intercession of the Blessed Virgin Mary, and ask Our Lady to help you pray. She loves you, so she will intercede on your behalf, removing any obstacle to prayer, as she desires you to be in a deep and intimate relationship with her Son. “Refraining from food and drink as an expression of interior penance, in imitation of the fast of Jesus for forty days in the desert. Fasting is an ascetic practice recommended in Scripture and the writings of the Church Fathers. It is sometimes prescribed by a precept of the Church, especially during the liturgical season of Lent” (CCC). When we fast and abstain, we deny ourselves in imitation of Our Lord’s 40-day journey, in an act which moves us beyond ourselves. Any pain or discomfort we experience is meant to remind us of the pain and suffering Our Lord experienced in the desert, but even more so moves us to meditate upon suffering on the cross. These are two events in the life of Christ which remind us of His perfect love for humanity – especially the cross. It is by the cross that our wounds are healed and the doors of heaven are opened to us. Saint Rose of Lima said “Apart from the cross, there is no other ladder by which we may get to heaven”. Receiving ashes on Wednesday, March 1, 2017. When we fast and abstain, it is imperative for the Christian to keep the Crucified Lord before our eyes, figuratively and literally. It is then that fasting and abstaining do not become an end in themselves, but rather the means by which we grow closer to and more like the Pierced One, who said “If anyone wishes to come after me, he must deny himself and take up his cross daily and follow me“ (Luke 9:23). “Money or goods given to the poor as an act of penance of fraternal charity. Almsgiving, together with prayer and fasting, are traditionally recommended to foster the state of interior penance” (CCC). Lent is a time when we are able to not only think about those who are less fortunate, but we are moved into action to alleviate their struggle. There are different ways we are able to accomplish almsgiving. We can contribute to an organization or religious community whose charism is to care for the poor. In particular, I think of the Missionaries of Charity and the Little Sisters of the Poor. Their foundresses, Saint Teresa of Calcutta and Saint Jeanne Jugan, responded to the Lord’s invitation to not simply give of their treasures, but to give of their lives in service to the poor. This was an act of love to the people who were closest to them. Saint Teresa of Calcutta said, “It is easy to love the people far away. It is not always easy to love those close to us”. Here in the Diocese of Gallup, as well as other places in our country, the face of the poor is very real and near to us. As an Lenten act of love, our almsgiving is able to meet the needs of the poorest of the poor in our midst. Many of you have offered prayers for my healing, of which I am grateful. If you are unaware, I have been quietly struggling with an imbalance (vertigo) issue for the past year, thinking it to be something that would simply pass. However, it didn’t go away and only seemed to increase, especially toward the end of 2016. Thankfully, through the good care of doctors, I was diagnosed with bilateral vestibular damage, which was caused by antibiotics I had to take for a nasal infection a year ago. The damage is permanent, but the effects are not, as I have been working closely with physical therapists who have helped me get back to some sense of normalcy. It’s a slow process, but if I stay up on my exercises I’ll be back to normal in a month or so. Please continue to keep me in your prayers, as they are greatly appreciated.